Skeletal muscle is invaluable for our day to day functioning, controlling voluntary action. However, due to the discrepancy in activity and size of skeletal muscle around the body, a highly regulated circulatory system is required. In this article, we will look at the vasculature, metabolic adaptations and other applications of the skeletal muscle circulation. Levels of activity of skeletal muscle can vary massively. At rest, many of the capillaries are closed off from the rest of the circulation due to contraction of pre-capillary sphincters. There is also a very high vascular tone, resulting in the vessels being constricted. These properties of the vasculature mean there is redundancy within the system, so it can cope with the increased workload during exercise. Relaxation of the pre-capillary sphincters allows increased perfusion to the tissue, and there is a further increase in blood flow due to vasodilation of the vessels. Fig 1 – The sphincters allow a high level of control over the blood flow to muscle. As metabolic activity increases, so does oxygen demand, and the main response that allows this to occur is increased recruitment of capillaries. This is done by several mechanisms, including the action of adrenaline, accumulation of local metabolites and by nervous activity which promotes vasodilation. Skeletal muscle is also important in helping venous blood to return to the heart, especially in the lower limbs. 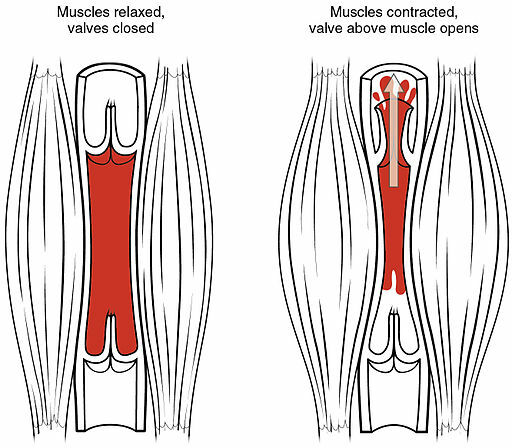 Veins within the muscle are compressed as the muscles contract, and this effectively acts as a secondary pump. This forces blood back to the heart that would have otherwise stagnated and pooled in the lower limbs. Fig 2 – The contraction of the muscle forces the blood back towards the heart. Intermittent claudication is a symptom that describes muscle pain, typically in the lower leg, that occurs during exercise. It is much like angina in that it is often relieved by a short period of rest. It is often due to peripheral arterial disease and if not treated, can progress to critical limb ischaemia. As it is a symptom, it is typically diagnosed when a patient presents with the typical history of leg pain on walking that is relieved by rest, however, as similar symptoms can present due to spinal causes (neurogenic claudication), tests such as ultrasound are used to detect the presence of arterial disease. Treatment involves modification of risk factors, such as ensuring lipid levels, diabetes and hypertension are well controlled. These medications however, will not remove the narrowing, but will help to improve blood flow to relieve the symptoms. Catheter-based interventions such as stenting and angioplasty can also be performed to try to remove the blockages. In severe cases, vascular surgery may be required, with an arterial bypass being the most common procedure within the legs.